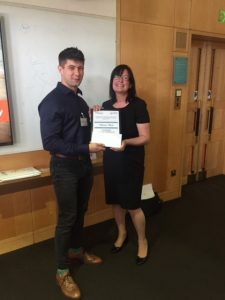 The winners of 2016-17 prizes received their certificates and cheques at the recent LASER Access to HE Conference and the British Library in London. 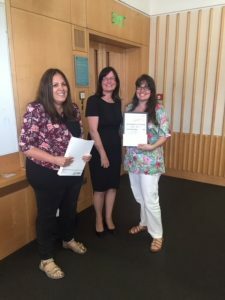 Three of our four winners were able to join us on the day to be presented with their prize by Julie Mizon, Access Manager at QAA. We are delighted to announce the winners for 2017/18 below. Students will be presented with their prize at the LASER Access to HE Conference in the summer. “Amber is an exceptional student, most notably in terms of her commitment to study. 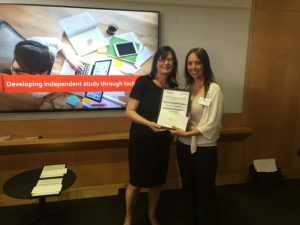 Despite facing a range of personal issues, the demands of life as a single parent to three young children and having missed a great deal of education at the Key Stage 4 level, she has taken every opportunity given by the Access course and has in turn become a highly proficient independent learner. “Kelly came onto the Access course having already attempted and dropped out of A Levels and BTEC courses in both Public Services & Childcare. It very quickly became apparent that Kelly was unusually able in terms of her interest in new ideas and curiosity of mind. In addition she was able to present her work in a creative and original way that demonstrated her ability to comprehend and analyse complex ideas. Students proposed in this category should have excelled in their academic study by producing assessed work of a consistently outstanding academic quality whilst on their Access courses. Along with completed nomination forms, you will need to submit up to 3 examples of the nominated student’s work (of which one piece must be the Extended/Independent Academic Study unit. Students in this category should have shown outstanding commitment to their Access studies, perhaps in the face of difficult and challenging circumstances. Nominations in this category should be supported by a detailed statement from the nominator and a student statement. Examples of work are not required for nominations in this category and will not be presented for judging. Nominations for 18-19 are open! Please return completed nomination forms, preferably via email with ‘Access Prize Nomination’ in the subject header to Georgia Smith, Access Customer Support Officer at g.smith@laser-awards.org.uk. Postal nominations should be sent to Georgia at, LASER, Access Prize, Canterbury Innovation Centre, University Road, Canterbury, CT2 7FG. For enquiries call 01227 811827.